In my early years of marriage, I had no idea what my role as a wife entailed. The Bible describes a wife’s role, of course, but the thought of digging in to discover that wisdom never crossed my mind. Oh, I had the physical jobs down fairly well. I knew I need to make food, keep the house organized, and do the laundry, but I didn’t visualize God wanted much more of me other than praying for my husband. Love him, yes. But the revelation of that hadn’t materialized yet. One day, I made a list of a half dozen changes I wanted my husband to make, and “found” some verses to go along with my judgments of him. The changes I desired weren’t necessarily bad, but I went about it wrong. Have you ever made a mental list of changes you wanted your husband to make (or anyone for that matter) and in your heart demanded he make the changes right away? Most would stop there or share with gentle, open communication. I gave him the list and pretty much demanded he make the changes—soon. Wow, I’m cringing remembering that. Yeah, I’m not proud of that moment. I took over the role of Holy Spirit; I prayed over him every day, going down my list. With my Bible verses attached. Most of it was a blind attempt to manipulate God into changing my unhappiness. Then a couple years later, I was still unhappy about some things and wrote him a letter. He always responded how he wanted to make me happy. Hopeful, yet unsatisfied, my eyes were peeled for any missteps on my list. It seemed like we never went past square one. One night when he was out of town on a trip for work, I felt like I couldn’t take it anymore. My heart wounds sat festering. Desperate pleas to God and two boxes of tissues later, I realized I wanted to threaten him with an ultimatum. Yet I knew that wasn’t right. But I sincerely wanted the answer. What on earth do I do to change these problems? To change him? I looked toward the bookshelf to my left. A sliver of hope lighted my tear-stained eyes when I saw a book He seemed to illuminate. It wasn’t a book on marriage exactly, but it seemed to be about living as one with your spouse. I began to drink in the words with full expectation that the secrets of my husband’s transformation were now at my fingertips. Each day I decided to read a new chapter, but as I absorbed the words on the page my pace slowed. Through the author’s words, the Holy Spirit sliced away at my perceived righteous actions. The “submission” word surfaced. I tried to keep the magnifying glass away that God had pointed toward me, but the Spirit was relentless. He answered my call for help through dealing with me. I succumbed to His examination. Was my heart turned to my husband in submission the way God designed? Wait God, I thought I already told you I was working on what I needed to change. Isn’t this about how HE needs to change? But God wanted to open my eyes to how He designed a wife’s role to her husband to be. The book I was reading didn’t delve into that. God led me to seek out the verses on my own—and then begin to apply them. 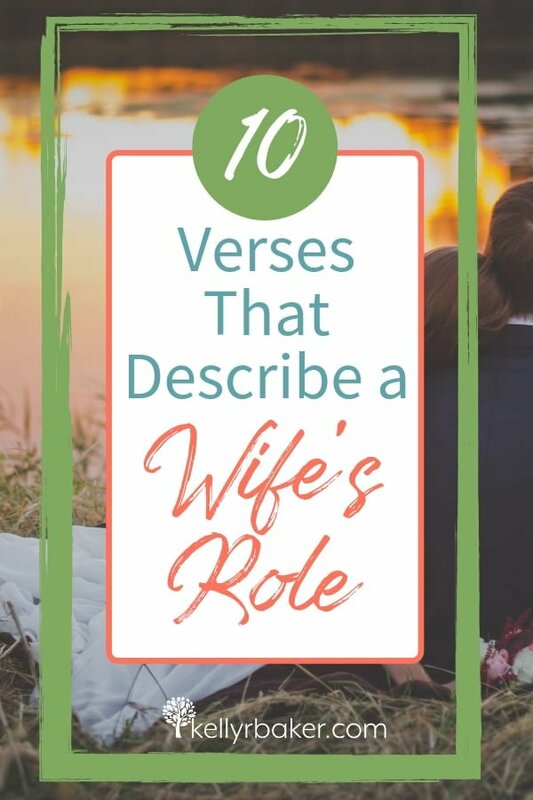 What does the Bible say about the wife’s role to her husband? God has given the wife some directions and wisdom concerning this delicate relationship. When He led to me find the wife’s role, He showed me that even though love is on the list, I could preface each with the choice to love. Doing this transformed my marriage. Look at each of these as if they were ingredients to your favorite dessert. If you were missing some or even one of the ingredients then your special treat might not taste as delicious! Look a that list again. Study them out and let them sink in, consistently making them a part of you with God’s help. When marital problems arise, I must not try to be my husband’s Holy Spirit. It isn’t my job. My responsibility is to love him. And when loving comes hard, I make the decision to love in spite of difficulty. Then focus on fulfilling my role as a wife as described in Scripture. After almost 17 years of marriage, I’m still growing in it. Are there any on the list I missed? Yes, indeed…”But God wanted to open my eyes…” He is so faithful! Great post that I’m sharing with friends! Yes, God is good! Thank you so much for sharing! What a good list you’ve made here, Kelly. I appreciate this. Pinning it now. And yes, I’ve had to give up the mission of changing Jose into a Betsy clone. (Change him, Lord, to make him more like me, see things like I do.) So much better to respect, submit, love. It’s not easy, but God’s way brings blessing. Thanks for pinning, Betsy. May God bring you and your husband closer to Him! That point you made about missing an ingredient for a dessert makes so much sense! I’ve never really thought about it like that, but if I’m not loving in all those ways, am I really loving to the best that I can? Thanks for this great perspective! That analogy helped me connect the big picture, too. So glad you stopped by, Emily! Great encouragement here. I love lists and so this is perfect for me to pray over!! Aww thank you, thank you! Great to see you here, Tiffany! I was thinking about each of us trying to do the work of the Holy Spirit to change our husbands. It is so important to let the Holy Spirit work in us and change us first. The moment I allowed that change ,all the things that bothered me about my husband were gone. Amen! We were never called to be the Holy Spirit to our husbands. Better to be listening to His voice of correction and comfort in our own walk! Kelly, Thanks for sharing these great reminders from Scripture of how to show Christ to our husbands. Kelly, such great wisdom here! Your ten verses are spot on. I think the biggest thing I had to learn is that respect wears different appearances for different men. What I thought he wanted and what my husband actually considered me showing respect were sometimes very different. I won’t analyze it, but learning what respect looks like to my husband is one of the biggest things that transformed our marriage. Such a helpful list, Kelly, and just the reminder I need as well. Thanks for this. Praying for us as we continue to grow as wives and bring glory to God. Great list here, Kelly! I think many times God changes us instead of our husbands! Convicting and encouraging! This is a good list, one I need to keep around. Love this post! I started trying to change my husband like this too then grew pointed out the logs in my eyes. So instead of aiming for perfection, we are going for God-pleasing which will hopefully mean we please each other too. I’ve got some of those verses still to work through like having a quiet spirit! Yes, pleasing God over perfection! Thanks for sharing, Vicky! Oh, I’ve certainly been there, Kelly, and done that! You are not alone at all on trying to change our men! But I’m so grateful that you let the Lord turn the mirror that you were pointing to your husband back to you. Isn’t that just how God is? He’s able to convict in the most gentle and compelling of ways! Thanks for this reminder and the wonderful graphic too! I’m pinning and sharing, my friend! Yes, it’s definitely a work of grace! 😉 Thanks for sharing, friend! And what is the role of the husband? Please forgive me; I’m a little behind in answering blog comments. That’s a good question, and one that we can only find the answer to in the Word of God. Have you studied it out? I have briefly because I want my focus to be on doing my part. I think if I looked to heartily at what my husband should be doing I might be tempted to point the finger if he’s not doing it. You know what I mean? At any rate, Ephesians 5 reveals that he is to be our head (more on that in this post: https://kellyrbaker.com/decide-leader-christian-marriage/ ) and reiterates three times that he is to love her. Hope this helps! Ooohhh… Such a convicting post filled with truth! We can’t have a masterpiece marriage if aren’t will to follow the Master’s plan! Thanks for sharing both truth and transparency! Blessings!